George Balanchine, Agon, 1957. Rehearsal view, 1957. George Balanchine and Igor Stravinsky watch Diana Adams and Arthur Mitchell. Photo: Martha Swope. IF YOU CARE ABOUT BALLET from the second half of the twentieth century, one of your wished-for fly-on-the-wall moments is probably a late rehearsal, back in 1957, for a new piece by George Balanchine. It’s called Agon. Music by Igor Stravinsky. Today, Stravinsky himself is stopping by to see a run-through. In dark glasses, a vest, and a tie, he sits with the choreographer at the mirrored front of the room. The dancers begin. Stravinsky beats time. Balanchine snaps his fingers. At one point, the pair consult with the rehearsal pianist, and a corps member rests on the floor in front of them. 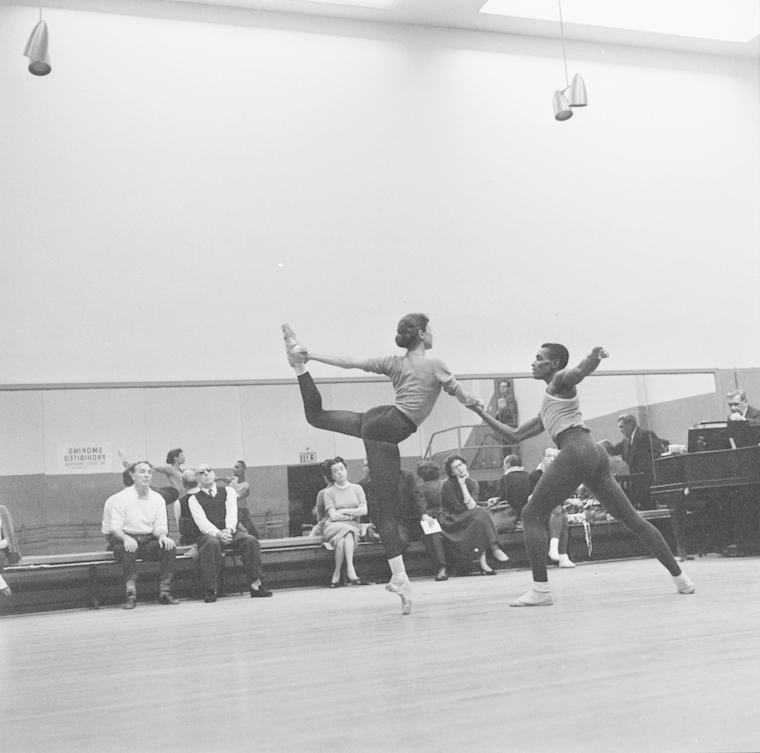 Finally, Arthur Mitchell and Diana Adams perform the ballet’s revolutionary pas de deux, in which, as Melissa Hayden remembers, “it was really awesome to see a black hand touch . . . white skin.” Everyone in the rehearsal studio can sense how important this is. I wasn’t there, but I can too. I can because of the photographs. Martha Swope took them. Dance and theater have always relied on imagespaintings and lithographs, then posed photographic portraits, and finally, as technology allowed, crisp shots capturing performers in motion. Pictures help a potentially infinite audience see a fleeting art that only a few, relatively speaking, watch in person at each show. Swope was a great photographer of dance and theater. For nearly four decades, she chronicled Broadway productions and performances by the New York City Ballet, American Ballet Theater, and other dance companies. She was also a great photographer of process. She brought her audience into the studio. You might have to go back to Degas to find an artist so good at capturing dancers at work. She shot rehearsals of Dances at a Gathering and The Wiz and A Chorus Line; she showed us Chita Rivera and Edward Villella and Patti LuPone practicing steps. Swope’s career included the “dance boom” of the 1960s and ’70s, and she understood how to feed curiosity about an art form while never travestying the artistry or diminishing the admiration it deserves. Her rehearsal photographs show the sweat and scuffed shoesalso the camaraderie and effort. Her photography career began, fittingly, when Jerome Robbins asked her to take some pictures as he worked on dances for West Side Story. Soon after, Lincoln Kirstein hired her as a full-time photographer for NYCB. Swope was then a student at the company’s feeder academy, the School of American Ballet, to which she’d come from Waco, Texas, after one year at Baylor. But with Kirstein’s request, she abandoned her plans to become a dancer and put her energies into what had previously been a hobby. Eventually, she worked for other companies, publications, and productions as well. Her dance training helped her to know just when and how to capture the line of a pose, the force of a gesture, the sweep of a movement. It also helped her gain the trust of dancers and performers, thereby achieving the modest wonder of her access and range. Her pictures aren’t about exposure or exploitation or pride. What she photographed, she understood. The photographs share that understanding. In 2010, Swope gave her archive of more than a million images to the New York Public Library for the Performing Arts. The Agon series is among them. Siobhan Phillips’s essays and poems have appeared in Boston Review, Harvard Review, Southwest Review, and other journals. She is an assistant professor at Dickinson College in Carlisle, PA.